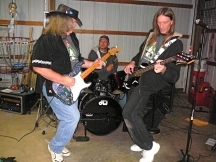 Apr 28 - Rick, Ozzy, & Skip @ "KKF 2012" party by Saginaw "over by the thumb"
Lots of impromtu jamming going on, and everything came out pretty dang good! For such a last-minute, thrown together gig, this sure turned out to be a mighty fun time. Although, grandpa Rick is feeling the pain now from all that driving, loading, unloading, jamming, drinking, sleeping on the floor, and more driving and unloading. The back-story on this party is this: last Saturday, Krys and Rick worked a few hours at the Allegan Area Arts Council annual benefit art sale called "Art In The Garden". My Doogie job was to play guitar near the membership table, to attract people as they passed by going in and out of the art exhibit. I think I did more chatting than playing, because several people wanted to ask about my Babicz guitar. Tom Lademan was one of the chatters, and he actually had his harmonica with him, and we had a little impromtu bluesy jam-along session. Tom was telling me this long story about how he and his buddies have been getting together every year since they were in school, "nearly 30 years". 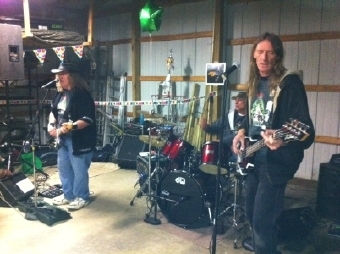 He said that last year they even had a band play, although the party wasn't a large group; only about a dozen people sitting around smoking and drinking. 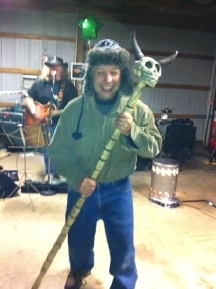 He said this year's party was the next weekend, and he was sad that couldn't get the same band (Hatchetmen ). At that, I said "well, if you really are hard up for live music, I could come and do my acoustic Doogie music, since Krystal will be in Florida and I have no gigs that weekend." Tom got all excited about that idea. He right away said, "could you bring your electric?" I said, "then I would want to bring my Bassman Ozzy along. I'll see if he's up for it." The next day, I got the okay from Ozzy, and then I decided to ask Skip Herrema if he wanted to play drums for our jam party. 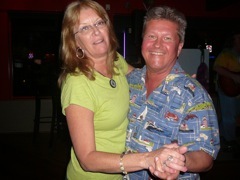 Skip said, "my wife Tammi is gone to an overnight family thing that night, so I was wondering what I'd be doing". Like it was meant to be. 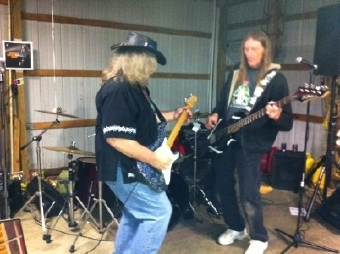 We spent several e-mails sending song lists to each other, and we had a Rick & Skip practice session on Friday night. The party's name was "Krystakazan 2012" or "KKF Party 2012" for short. Come Saturday, the day of the party, we crammed all our music gear into 2 cars and drove 3 hours to the party site. We got there at 6 and were set up and started playing at 8. 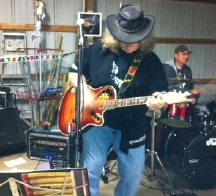 We played most of the songs that Rick normally sings with Tricks. Those were songs that Ozzy & Rick knew, but most of them were brand new to Skip, except for our brief Fri night rehearsal. Lots of songs were missing the Krystal harmony vocals. Maybe next time. There were about 6 Doogie solo acoustic songs, even though I was planning for a lot more. But, it ended up that the jam band fearlessly attacked many unrehearsed songs, so we didn't need much filling in with Acoustic jams from grandpa Rick. The most notable songs were the songs that even Ozzy never played with Rick before. So, both Ozzy & Skip were flying by the seat of their pants. And Rick needed song lyrics in front of him to add some old "jamming" songs from many years gone by. They all went amazingly well! Some of the scariest "unknown" songs from Rick's repertoire were: Thin Lizzy's "Jailbreak", The Stones' "Little Queenie", ZZ Top "Jesus Just Left Chicago", Tommy Castro's, "Suitcase Full of Blues", Ted's "Cat Scratch Fever" (with Tom "Whitey" helping on vocals), George Thorogood's "Get A Haircut", ... and a couple songs that brother Steve sings normally in Tricks, Rick sang ZZ Top "La Grange" and Robin Trower "Too Rolling Stoned"(Whitey came up after the Trower song, and said "that was the best song of the night"). - - - - Garage Band Beer Party - - - These are shots from Tom's phone cam. - - Tons o' Fun! While all this jamming was happening in the barn, we had about 15 guys hanging out drinking, eating, and partying in general. They had a great bonfire going, so everyone went out there once in a while to warm up. You'll notice in the pics that everyone has coats and sweatshirts on. Perfect bonfire weather, but cold guitar-playing weather. There was plenty of good "hunting lodge" type food, like venison, chips, beer, chocolate, whiskey, and more beer. Whitey kept telling us to take a break, but we wanted to jam, so we only stopped one time between 8pm and 1am. I wish we could have got there earlier. And it would have been nice to hang a little longer on Sunday morning after crashing on the floor from 3am to about 8am. I feel like we were the "hit and run music show". We barely got to know anybody there, and that feels wrong. The most chatting time I got in at the party was when we took about a half hour break just before midnight. We went and sat around the fire with everyone. That was great socializing, but seems like not enough. I thought it was cool when I said "let's go back and do 5 more songs", and someone said "Oh, I thought you were all done". I said something like, "we're not done until my voice is completely gone". Which, turned out to be the case. I had to push Ozzy & Skip off the "stage" at the end of the last set, around 1am because they wanted to keep jamming. But I knew at that point, I only had about 3 more songs left in me, and I wanted to be sure and get a few acoustic Doogie songs that Whitey had requested for "end of night drunkenness". They were my acoustic songs at the end; "Sweet Jane", "Lawyers, Guns, & Money", "Sultans of Swing", and MOST OF ALL, "Ziggy Stardust". I actually practiced that one on Saturday morning before heading out. I wanted to be sure I had those Mick Ronson guitar parts CORRECT. And it worked out really cool with Tom "Whitey" singing the David Bowie part, with all the boys hooting and hollering. It seems like Déja Vu all over again. Only maybe a bit better this time. This is our 3rd show at Rhino's, and we're detecting a pattern. When we start around 9:30, there is still some dinner crowd there, usually eating pizza or their special Friday night Crab Legs. Yum! As the dinner crowd thins out, the drinking crowd ambles in. They hang out until after midnight, but that drinking crowd thins out by our last set from 12:30 to 1:30, because people know that the cops are watching closely for people leaving the bar at closing time. So, by the time we quit singing at 1:30, there usually are only a handful of people left there with us. This Friday was different. We had a bigger than average drinking crowd hanging and banging with Rick & Krys, singings along with us, hooting and hollering, and requesting all kinds of interesting songs that we don't know. 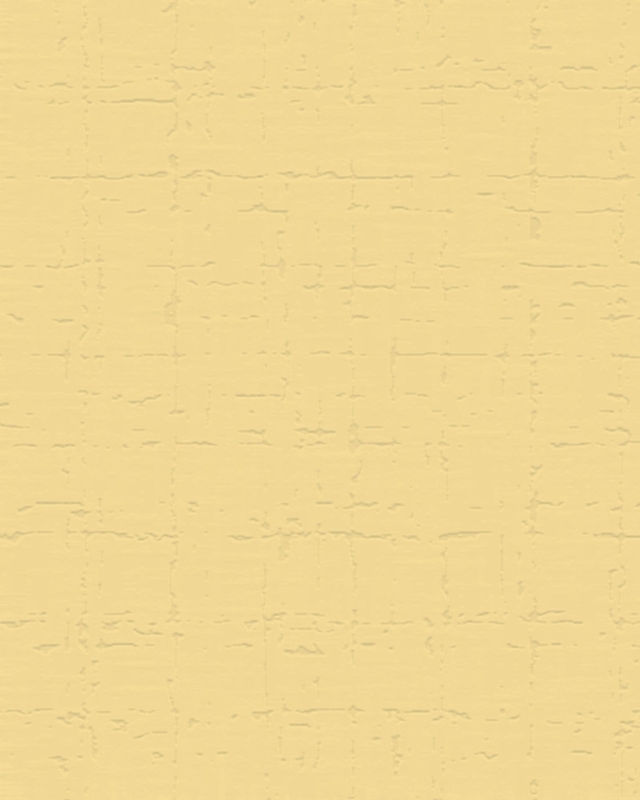 We managed to do a few requests, and put the rest of the requests on our "gotta learn" list. By quittng time, Dave the bartender was asking us to announce that he wanted everyone out "in 15 minutes". So we announced that just before we shut down and packed up. By about 25 minutes later, we were packed and ready to take off, and the crowd was still hanging out and rowdy as ever. I went up to Dave and said, "how's that 15 minutes going for you"? He just smiled and rolled his eyes. I noticed he was still serving drinks, even though it was 2am. They can serve until 2:30, but they usually choose to be closed up and heading home by then. We left Dave to fend for himself, and we hit the road, drained of energy from that wild crowd that just wouldn't stop. I hope everyone got home alright. Lots of these party people are within walking distance of Rhino's, so that's a good thing. Thanks to Kara Rose and her friends for coming, thanks Marcus & Amy, ... and Dylan as usual. Thanks Carol for coming all alone, now that's true dedication. We appreciate your support for Tricks band, including our Rick & Krys side projects. Thanks to Dave and the wait staff for putting up with the wild crowd that we were encouraging. Hope they were putting $$ in your tip jar. Thanks to Jen for hiring us. And thanks to Phil the owner. 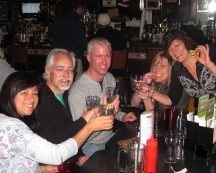 We like your place, and we get along well with your staff and patrons; they're our kind of people - fun, friendly, and full of energy. Rick & Krys make a quick return engagement at Rhino's. This is our kind of place; local, lively, ... and let's see what else starts with "L" to continue the alliteration? ... I know! ... And, they Like us there. And we like them. We really hit it off here in downtown Plainwell. 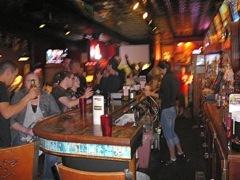 A super cool place with good food, sports on the TV's, and lots of people meeting up. Quite a rowdy and loud crowd. But, we rose to the occasion. Some wild chicks were asking for some acoustic Hard Rock. So we gave them Theory Of A Deadman's "Bad Girlfriend". And they ate it right up, headbanging and dancing with us. It was the first time we ever tried that songs without electric guitars, but it worked really well. Pleasant surprise! Jennifer and Brenda were celebrating birthdays, so we sang our acoustic Beatles "You Say It's Your Birthday". That always cracks me up. In fact, lots of these rock tunes are fun as hell when you turn them into acoustic guitar songs. Thanks so much to Jen the manager & Phil the owner for hiring us. 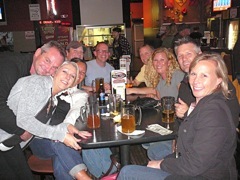 We hope to be back at Rhino's every other month or so, depending on their schedule and ours, Rhino's has a lot going on. They like to bring in the comedians whenever they can. Check out their website here . Thanks a lot to our friends and family who came over to Plainwell to support our party efforts. Dylan lives right down the street, so he can stagger home. Kara & Rich live a few miles West of town. It was cool the Kara won $140 on one of Rhino's gambling machines. So guess who was buying Rick waaaaayyy too many drinks? We love this place. I know I keep writing that, but it's the simple fact of the matter. I'll explain it again; the people who frequent Micro Breweries are the adventurous type. They are not the "Bud Lite" crowd who are happy following the well-beaten path (not that there is anything wrong with that; popular paths are usually popular because there is a reasonable amount of quality to be found there). The Odd Side Ales crowds are the types who often prefer hitting the byways instead of the highways. They are not expecting to hear acoustic "hits" that every other musician is playing up and down the street. They expect and demand quite the opposite. So, the Rick & Krys show doesn't have to be distracted by the need to serve up "popular faves". We can do some totally unknown stuff, and we always get applauded for it. For example, on Saturday Rick did his new tune "Many Too Many" from Genesis "Then There Were Three" album, and lots of people gave positive feedback. How often will that happen for such a relatively unknown song? Who even knows that album or likes that kind of obscure music, with key and time changes? Not to mention the strange lyrics? Most people have a low tolerance for that type of noise. But, the adventurous brew lover usually has some taste for the unusual. We'll be back here on Fri, May 4, but are sad that Odd Side Ales is trying out a single-night music schedule for a while. They are booking a different music act for each night, so we are only there one night at a time. They also are hiring bigger 4 and 5-piece bands, expanding their live music shows. We understand the need for variety and novelty; that's called "Show Biz". We understand that bars have to keep trying new things all the time. So, it's okay and I hope it goes well for Odd Side Ales. But, we prefer double nights, because we often hear from new friends, "we're going to come back tomorrow and bring our friends". It happens all the time, and that's what we'll be losing when we lose those Fri / Sat weekends at the same venue. If you're ever in Grand Haven on Fri & Sat, here is where you'll find Odd Side Ales. We want to encourage you to check out Odd Side Ales for ambitious brews and and live local music. They don't settle for the same ol', same ol'. 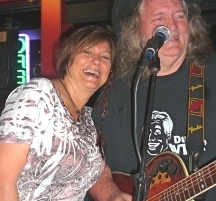 Rick & Krys make their debut appearance at Rhino's in Plainwell, and it was a good one for us. Cold outside, but warm and cozy inside at Rhino's in downtown Plainwell. We felt lots of love from the crowd of new friends, and we had several of our friends come and give us some extra support. Thanks so much for coming out to party with us at Rhino's. A few new friends said "where have you been hiding"? And we got asked back, as well as getting some tentative party bookings from people who wanted to have their own Rick & Krys party at their house. What a warm reception. Thanks so much to Phil the owner and Jen the entertainment manager for giving us a try, and for hiring us back. We hope that Rhino's can be a regular stop on our Rick & Krys party rounds. We'll be back here in March. Thanks to Jeremy for helping take some photos. Check out these pics. We love bringing our Rick & Krys Show to Odd Side Ales in downtown Grand Haven, even when we have an hour & a half white-knuckle drive in a winter storm to get there. Friday was the worst driving conditions. We saw three cars in the ditch on the way to Grand Haven - one car was upside-down. Scary! On the way there, we were talking about the possibility that very few people will be braving the weather to come out and drink brews and socialize at Odd Side Ales. But, what a pleasant surprise! The place was packed and hopping with fun when we got there. Friendly folks offered to help us carry in our gear, but we explained that we didn't have much to carry in. But, what a friendly crowd. Everyone was very receptive to the acoustic tunes, right from the git-go. Lots of hooting and cheering and singing along with the music. It always scares me to see people mouthing the words of songs I'm singing; I know then that I can't be screwing up the words. People are actually paying attention. It's a fun adrenaline rush. Around 11pm the crowd thinned out and I thought we might go home early, but five minutes later the "2nd shift" showed up, and the place was packed again. Odd Side Ales is pretty small, so it only takes a couple dozen people to "pack" the place, but we always like to say that Rick & Krys want a crowd with Quality, not necessarily Quantity. On Friday we talked with a couple at the end of night, and said "you were here from the very start, weren't you". They said, "yes, we came in for one brew and just loved your music, so we ended up staying late". Besides all the board game action, one other thing that adds to the party atmosphere at Odd Side Ales is that they encourage people to bring their own party food. Lots of people bring in party snacks and pot-luck dishes to share with friends. It feels like a big happy family reunion, only better. Krys brought a crock-pot of chili on Saturday, and we shared it with the crowd. That was a big hit. There's not much to say that I haven't already said about Odd Side Ales. They have a great selection of brews, and Chris the owner keeps introducing new flavors and experiments for adventuous brew lovers. We try to match that adventurous spirit with our song selections. 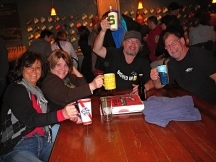 Some folks were chatting with Krystal while Rick was packing up after midnight on Saturday, and they summed up our feelings about Odd Side Ales; "It's nice to come into a place and have such a chill atmosphere, with no TV and no bright lights and such great music where each song is a fun surprise. And great brews." Thanks so much to Chris the owner for providing such a cool place, as an alternative to the "Bud Lite" bars down the street. 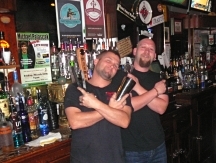 Thanks to the bartenders for keeping the brews flowing and the crowd happy. Thanks for all the new friends and fans. We appreciate all the kind words from the Odd Side Patrons. Looking forward to our return, last weekend of Feb, . . . and beyond.